The story of Aafia Siddiqui is difficult to read, especially if one is not aware of it. It is difficult to believe that people can be so evil; yet, we know that agents of the US have done much worse to many people the world over. The particulars of Aafia's story are difficult to comprehend, such that one might believe earth is indeed purgatory or hell, a place to which we are sentenced to endure our own evil natures and perchance overcome them. Read the entire story here. 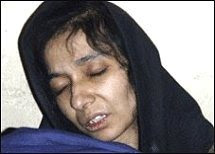 The lies that have been told by the US government about Aafia and what has happened to her for years while in US custody show the true ugliness of the US culture and its delusions about its right to perpetrate any type of atrocity for its own benefit. At last, there is proof which stands above the lies and a chance for us all to know the truth. We must demand this truth - and hold those responsible to account for their unforgivable atrocies, not only perpetrated on Aafia, but on countless faceless others whose stories will never come to light. Recently Seymour Hersh has come forward with shocking revelations about the Cheney murder and torture machine so well hidden for so long. He made his astonishing claim during his first ever television interview on the international satellite Press TV, which is on aired at 8.07pm (in UK) on Thursday (00.07am Friday Pakistan time) on Ridley’s weekly political show “The Agenda”. Ridley started her quest for the truth about Prisoner 650 in Pakistan last July and sought the help of the country’s media with the help and support of Imran Khan who organised a press conference at his party’s headquarter in Islamabad. Begg said, “After my release I discovered females were indeed held by US forces in Bagram and elsewhere. One of them is Aafiya Siddiqui. Our suspicions were confirmed when Binyam Mohamed told Cage Prisoners during an exclusive interview that he had seen her whilst he was held in Bagram. It is time the US military to face up what they have done to this poor woman and her children”, said Moazzam Begg. Commenting on the revelation, Chairman Tehreek-e-Insaaf Imran Khan is of the says, “It is obvious that Binyam Mohamed’s personal eye witness account of the woman he saw during his own incarceration in Bagram should be taken seriously. He says he is “100 percent certain” that the woman detainee he knew as Prisoner 650 is Dr Aafiya Siddiqui. He drew this conclusion after seeing photographs and images of Dr Siddiqui during a private screening of Yvonne Ridley’s documentary In Search of Prisoner 650". Binyam Mohamed is a man who has endured horrific torture in Pakistan, Morocco and in Bagram - and yet despite enormous pressure from the US, he has continually refused to lie or give false accounts, even in exchange for his freedom. We know this to be true because of the recent release of secret documents from the British High Court. Imran said the words by Binyam Mohamed could be trusted over that of the Bush administration exposed continually for its lies and deceptions, which became its hallmark during its War on Terror. He said Tehreek-e-Insaaf, have been calling for full transparency since Dr Siddiqui had disappeared. After Yvonne Ridley came to Islamabad in July 2008 to tell me about her concerns and fears about the woman she described as the ‘Grey Lady of Bagram’, the US Administration continually misled us in our attempts to discover the true identity of Prisoner 650 and initially even denied her existence he added. “There is a new administration in Washington now, one which we were told had a full desire for transparency - it was very much part of Barack Obama’s election pledge. In the spirit of this new era, I also want to know the extent of Pakistan’s co-operation in the involvement of Prisoner 650 and Dr Aafiya Siddiqui, especially if they now appear to be one in the same”, he concluded.